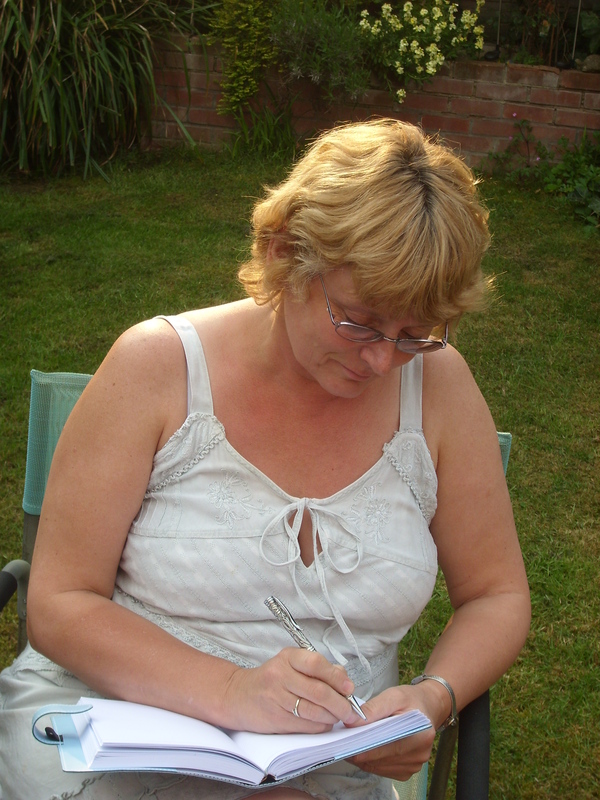 Elaine Everest tells how entering competitions can help a writer advance their career. I love a deadline. Nothing is more likely to have me putting pen to paper than a clock ticking loudly to remind me that I’ll miss an opportunity if I don’t put pen to paper and write. For me, any writing competition needs to have a dual purpose. The first is the chance to be shortlisted, perhaps even win. The second to have a piece of work which can be used elsewhere. That means sold it on to a magazine. My first major success was in 2002 when I entered a short story competition organised by BBC Radio Kent. Each month they supplied the first line of a story which listeners had to complete it in 750 words. A shortlist was declared and then judged by online votes and the radio presenters. The first three competitions I entered didn’t produced even a shortlisted placing but I did have three stories that could be used elsewhere – two were later sold albeit as longer stories with more plot. April came round and the line, ‘Security at Bluewater was tight’ had me scratching my head. Fortunately, I accompanied my husband when he had to deliver CCTV equipment back to the security department at that very same shopping mall. As I sat in the van at the back of the complex and looked at overfilled waste bins and staff coming and going I realised this was a very different image to the glossy shops that most customers saw. I began to wonder about the lives of the staff. Were they happy? How did they spend their days? Gradually a story began to form in my mind and it was like no other story I’d written to date. For one it was crime and another it was written in the first person. Early in 2003 the twelve stories were judged live on air. Well known author Jane Wenham Jones as well as a tutor from the University of Kent and an executive from the radio station listened as the entries were broadcast. They then decided on a short list. To say I was nervous was an understatement. As my story was declared the winner my telephone rang. It was Pat Marsh, the presenter of the radio show, wanting to interview me. Now, at this point I’d like to have said that I was seated calmly, chatting as befits an author, but no I was waving dog chews at my dogs trying to keep them quiet and then tripped over one of them. The first part of the interview was done with an elderly Old English Sheepdog trying to sit on my head. No competition win was quite like that one, thank goodness. That one story, in one form or another was published, seven times and also managed to raise money for a cancer charity in an anthology. It has now been retired. However, the win made me known as a writer and to this day I am invited to speak on Radio Kent about my writing life o when I have a book published. Since then I’ve been a finalist in the Harry Bowling Competition and also shortlisted in a competition with The Festival of Romance in 2012 with my romcom, Bride of the Year. Another win in a novel writing competition led to me being published by Myrmidon Books, Pulse Romance imprint with my family romance/saga, Gracie’s War. Yes, competitions are certainly worth entering! When I was young it was the ‘done thing’ for all women to retire at sixty, ready to put their feet up, with their pension and a gold clock safely in hand… but it seems that with every year I got older the rules kept changing in front of me. Suddenly, quite out of the blue (because I just don’t feel or look that old! ), the big birthday was looming up at me, and the new rules said that I was expected to carry on working for another five years… or even more. Oh dear! The thought of that wonderful dangling carrot being snatched away at the last hurdle just didn’t sit comfortably, and so I started looking closely at my finances (mortgage paid, new car that should last me for years, one daughter married off and the other living independently), made enquiries about taking one of my two work pensions early (with a hefty reduction, but it’s worth it), and started to take control! And now, it’s here: my 60th birthday, and my final day as an employed person, getting up early and going out in all weathers, doing what I’m told to do by someone else – and the start of my new, exciting and slightly scary life as a freelance self-employed FULL-TIME writer! The pension cheques will just keep rolling in every month without me having to lift a finger, so there’s an income, even though a slightly lesser one than I’m used to. Anyone who calls me ‘retired’ will be severely dealt with. I am still working, just as hard as before, but for myself – and, besides, being called a pensioner makes me sound way too old! In theory, at least, I will be able to write more – once family and friends get the idea that me being in my ‘office’ at home does not make me available for phone chats, coffee, shopping, babysitting etc. at the drop of a hat. And more writing time means more stories means more income! I will, without any more procrastination, get on and finish my novel in progress and get it ‘out there’ to be critiqued and maybe even accepted for publication – in 2014. Without fail. Without doubt. No more excuses. In another five years or so, the state pension and my second ‘nest egg’ work pension will kick in, giving me enough to live on quite comfortably for life, even if my writing arm falls off and I never touch a pen or keyboard ever again. As if! So there’s no risk, is there? Five years to give it my best shot. And, who knows, I could be a bestselling novelist by then. I’m certainly going to give it a damn good try! Natalie Kleinman shares her experience of graduating from the Romantic Novelists Association’s New Writers Scheme. I considered myself very lucky when I was accepted into the RNA New Writers Scheme in January 2013 at my first time of trying. The discipline of the end of August deadline made sure I finished on time and the knowledge my novel would be scrutinised by other writers seemed far more daunting than submitting to a publisher. I lost count of the number of edits – there were many – before I parcelled up my contemporary romance and sent it in with fingers crossed. Then came the wait but when my critique arrived I was astonished at the attention to detail given by my reader along with such comments as led me to believe I was close. There followed another edit and submission to Safkhet Publishing who came back very quickly with the offer of a contract. That’s when everything changed. Now might be a good time to backtrack a little. I have been attending The Write Place Creative Writing School for two years. So busy was I writing that I had no idea about the greater picture until doors were opened to me, or at least presented so I could open them myself. With their knowledge of the market I have now had numerous short stories published, something I am sure wouldn’t have happened had I been ‘out there’ on my own. It was TWP who pointed me to the RNA and the entrance to another world. I recently attended the RNA Winter Party where I was greeted by a wall of sound from what seemed like hundreds of people all talking at once; daunting to say the least. I needn’t have worried. I was greeted, enfolded and made to feel I belonged. From 1st January 2014 I will be a full member of the RNA. It’s been quite a year. So is that the end of the story? No, it’s merely the start. I have learned that writing a book, though huge in itself, is the forerunner to a number of activities which till now had only been words but recently added to my vocabulary. Facebook; Twitter; Blog; Social Networking. I have been comfortable with Facebook for some time now and have made some lovely friends. I am familiarising myself with Twitter. This is my first blog! Terrified? You bet, but I’m hoping to be at ease with it very soon. I will be visiting nearby bookshops, contacting the local paper, introducing myself to any organisations I can persuade to listen. All this seems a million miles away from my first love, writing, but is a necessary part of the whole procedure. If my heroine can leave her life behind to work on a cruise liner, well maybe I too can embark on my own journey into the unknown. I hope to see some of you there. 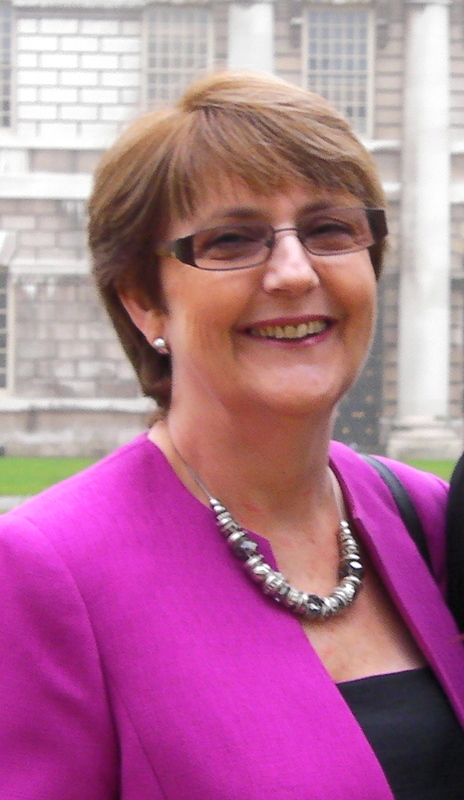 After having 100 short stories published in UK women’s magazines, I have now given up my ‘day job’ working with the under-fives to concentrate on a full-time writing career, although I still write extensively for childcare and nursery magazines on early reading and education topics. I am a life-long crossword addict, and my new book ‘How to Crack Cryptic Crosswords’ helps others learn how to solve them. My first e-book novel, ‘Losing Lucy’, was self-published in 2012 and, as a member of the Romantic Novelists Association’s New Writers Scheme, I am now working hard towards clinching a publishing deal for novel number two! 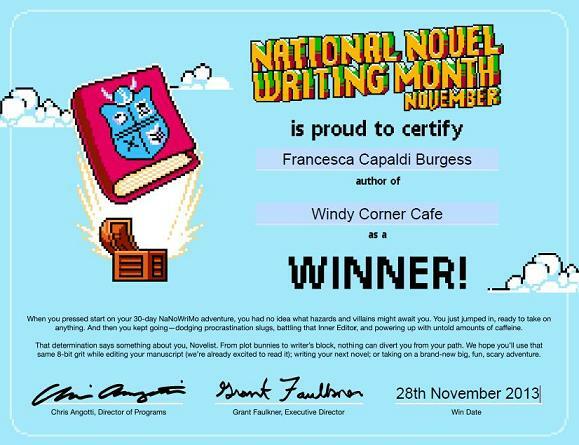 Francesca Capaldi Burgess tells us of her experiences during National Novel Writing Month (NaNoWriMo) and how it can be a useful writing tool. I did my first NaNoWriMo in 2009, and have completed 50,000 words every year since then (a total of a quarter of a million words, I have just realised!). I find it’s a really good discipline, and although I write all year round as a freelancer (mostly short stories), I do more words per day during this time than any other. It always gives a good boost to whichever novel I’m working on. One year I was half way through NaNo when I finished the novel, so used the other 25,000 words for short stories. NaNoWriMo, for the uninitiated, stands for National Novel Writing Month, and always takes place in November. It was started in 1999 in California, by freelance writer Chris Baty, and that year had only twenty-one participants. This year it has 308,035, spread over five continents. The idea is to write 50,000 words in a month, roughly 1,667 a day. If you sign up on the NaNo website, you can add your word count each day and watch your graph head upwards (hopefully). During the month you get regular emails with pep talks, often by well known authors. There are also local regions you can join to meet up with fellow NaNo members, who often have write-ins. Well over one hundred novels written during NaNo have been since been traditionally published. For the past four years I’ve done a writing retreat during the last week of NaNo with four fellow writers, the self-styled ‘Ladies With Laptops’. I’ve found this very useful for that last push. At the creative writing school I help run, we have many students who take part in NaNo. They don’t always reach 50K but end up writing more than they would have otherwise. We have a thread on our face book page to support each other, posting daily word counts and encouraging anyone who’s dropped behind. We make sure no one feels guilty if they don’t reach the target. An editor from a publishing house has recently shown an interest in the novel I was working on during last year’s NaNo (Ten Years Later), and I’m waiting for a verdict on that. I’ve sold some of the short stories I wrote on NaNo a couple of years ago. The first two novels I worked on, Sea Angel and How To Handle Plan B are teen novels, but so far I’ve not had any luck getting them published. The one I’ve been working on this year, Windy Corner Café was inspired by a café in Whitstable, which was handy as our retreat this year was literally up the road from it! I finished NaNo two days early this year, but I still have another 40,000 odd words to go on the novel. December slows right down in comparison, but I’ll be back to speed (though not quite NaNo speed!) in January to finish it off. Elaine Roberts tells us about her first twelve months as a novelist. Two events in the last twelve months have given me writing experiences I never thought I’d have. the events, Attending The Write Place in Dartford, Kent and joining the Romantic Novelists Associations New Writers Scheme (RNA NWS). The classes introduced me to, amongst other things, the RNA and to the Curtis Brown Literary Agency’s Discovery Day; both have enabled me to talk to publishers and agents as well as other writers. My first experience was at the RNA Conference when I managed to secure one to ones with two publishers, Harper Collins and Mira. I have to admit to being very nervous and approached it wondering if I’d be able to form a sentence together, when my time came. However, I was pleasantly surprised that both of the publishers put me at ease and gave me feedback on my work, which included some valuable constructive criticism. The second opportunity was at the Discovery Day, held at Foyles in London, which I attended with other members of my writing group, and was another nervous experience. I had to give myself a strict talking to before I left the house, but again I was pleasantly surprised at how “normal” and approachable the agents I met are. For the first time I had to give approximately a thirty-second pitch on my novel and hand over my first page for the agent to read, which we then spoke about. I think it’s important to remember they all want you to succeed, so they offer valuable and worthwhile advice. To anyone who wants to approach writing seriously, I would say attend as many of these events as they can, because it’s about listening, learning and above all else preparing. Offer the professionals the best work you can, even if it doesn’t end up being the best you can actually do, have faith and take their views on board. Before you pitch your novel, practice, practice and more practice. It is expected that you can sum up the main plot of your novel in fifteen words, so know your novel and your characters well before attending, then you will be able to talk about them confidently. Through talking to professionals, publishers and agents alike, I believe I have gained confidence and belief in my ability to become a published author. I’ve written since I was a child although it’s only been a full time job for the past ten years. I’ve sold over sixty short stories to magazines worldwide and also write features for numerous publications. Specialist in canine subjects has led to commissions to write three non-fiction books for dog owners. My first novel, Gracie’s War (Pulse Romance) was published in October which meant I bcame a full member of the Romantic Novelist Assocuation.